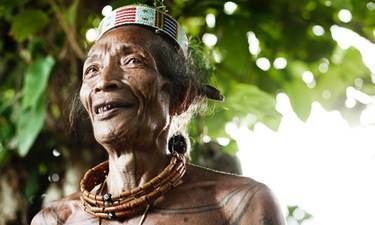 Meet one of the most interesting and unique tribes in the world – the Mentawai. 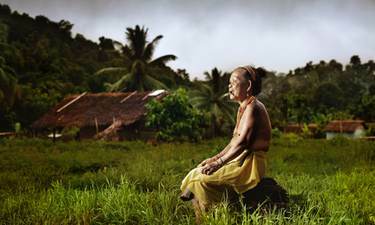 The Mentawai people live on the island of Siberut – about 100 miles from Padang, the capital of West Sumatra – and can be reched by boat. Siberut belongs to the archipelago of Mentawai islands which includes Sipora, North Pagai and South Pagai. 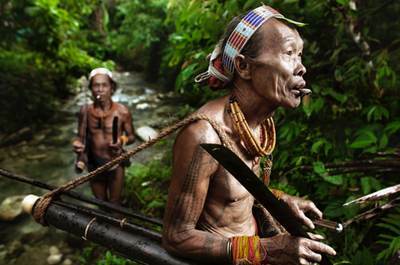 The Mentawai are animist, the only ones in Sumatra. They believe that all things in nature possess a spiritual essence, and they live in harmony and peace with the nature around them. By choosing us to organize your tour, you will discover the unique way of life of the Mentawai and take part in their daily activities, all organized with great respect for their culture. These activities include: traditional fishing in the river, canoe on the river, walking through the jungle, preparation of sago (a starch made from palm trees), feeding the pigs, making loin clothes, poison for arrow. But most of all, you will leave the island full of memories of new experiences and unforgettable encounters. Why visit the Mentawai with us? In order to sustain our eco tourism project in the village of Nagari Sungai Pinang, and to contribute to local life in a sustainable way, we hire young people from this village, as well as young Mentawai, and train them as our staff and as guides.These are bright young boys and girls who are keen to learn new things such as English, French and how to be guide in their own motherland. You will leave Padang with a trusted, trained guide assistant from the village, who will make sure you have everything you need during your stay. Once you arrive in Siberut, the Mentawai guide will be there to welcome you and spend the whole stay with you, teach you and share with you his knowledge about his people and culture, helped by some young motivated Mentawai people. Thus, by choosing us to organize your Mentawai trip, you not only choose for a unique experience with a knowledgeable local guide, but, moreover, you choose for a responsible, sustainable form of tourism (ecotourism), which aims to help the local community. Individual tour guaranteed – you won’t join other groups unless you request it. Our groups do not include more than 5 people to keep the good interaction between travellers and Mentawai. We offer flexible circuits, for the length of the stay that you wish, with no constraints. For further information and pricing, please contact us. Mentawai photographs © Diego Verges. All rights reserved. © MMXVII Authentic Sumatra // Ricky's Beach House. All Rights Reserved.